Nearest Car Park: Newbury station or Lambourn. Free parking at Welford Park. The Lambourn Valley Way follows the course of the River Lambourn in West Berkshire, passing through many small villages and past several local pubs on the way. The complete walk runs 22 miles in total from Newbury north to Uffington Castle along the valley of the River Lambourn. The Berkshire section of the walk is around 12 miles long, from Newbury to Lambourne or you could start in the middle at the snowdrop woods Welford Park and join as much of the route as you want to. From Newbury, head north of the station along Cheap Street to the River Kennet. From the Kennet, take a right turn up Northcroft Lane to meet the Lambourn Valley Way. About a mile further on, follow the signs for another right turn towards Speen, where the Second Battle of Newbury took place during the Civil War in 1644. The town became the home of the Speenhamland system after Magistrates met at the Pelican Inn there in 1795 and agreed to bring in support to supplement a labourer’s income according to the price of bread and the number of children in his family. The route then picks up the road and turns right parallel with the A34 before meeting the River Lambourn at Bagnor, which is home to the nationally acclaimed Watermill Theatre and the Rack Marsh Nature Reserve, where otters have been spotted. If you need sustenance at this stage, you could try the Blackbird Pub in Bangor, or carry on a couple of miles further to the Bell at Boxford. Here, the route leaves the river for the next two miles and passes under the M4 before crossing the road leading towards St Gregory’s Church and Welford Park. Although the present round-towered church dates from 1852, a church was listed here in the Domesday book over a thousand years ago. Welford Park’s esteemed snowdrop woods remain open until next Sunday, March 4th. Despite flowering early this year, due to the mild winter, there are still plenty around, especially in Snowdrop Wood, where the floor is carpeted. Near the house some crocuses and daffodils are beginning to poke their heads through too. 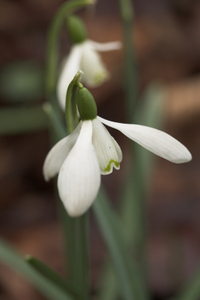 You can visit the snowdrops for £3 (children under 16 free) from 11am until 4pm this Sunday (4th March) in aid of the charities West Berkshire National Autistic Society and the Living Paintings Trust (who bring pictures to life for the blind and partially-sighted). There’s a gift shop next to the Old Laundry Tea Room which makes scrumptious home-made cakes and scones (and lunch if you arrive early), even dogs (on leads) are welcome and their owners have a special tea tent they can sit in with their pets. If you do start your walk from here, notice that the car park closes at 5.30pm. The Lambourn Valley Way cuts across the fields behind the house, you can pick it up from the snowdrop walk by crossing the stile at footbridge eight by Swan Island, but it is difficult to follow from here (you need to find the line of stakes in the ground). It’s probably better to follow the road right out from the car park and pick the route up again at Weston Mill by buzzing yourself through the gate next to the house. It’s certainly less muddy this way as much of this section of the route is waterlogged. Around two miles along the river from Welford Park is Great Shefford, whose name is derived from 'sheep ford'. St. Mary’s, the only other round-tower church in Berkshire is here near the Swan Inn, which would be an ideal place to stop for Sunday Lunch. Should you fancy going further, a couple of miles along the river is East Garston, where you can walk either way around the village. Taking the left-hand path you pass the 18th Century Queens Arms on the main road. A mile and a half further on is Eastbury, where, the left-hand route runs past the Plough pub. Two miles after Eastbury, you’ll pass Bockhampton Manor, a Grade II* listed Tudor manor house, before reaching Lambourne, which sits within the Lambourne Downs. Steam trains ran here on the Lambourn Valley Railway from 1898, independently until 1905, then under GWR to 1948 and finally BR before its closure in 1973. The twelve mile journey from Newbury to Lambourn used to take forty minutes (it takes a little longer by foot today, especially with the amount of mud around). There was even a station along the line at Welford Park. In case you still haven’t stopped for a break, Lambourn has two pubs, the Malt Shovel and the Lamb Inn. There is also a public car park in Lambourn where you could leave a second car at the start, should you wish to drive back to Newbury.